Should I choose O'Neal Law Firm as a lawyer for my accident case? Life has many choices, choosing the right lawyer for you or your family's accident case is one of the many important decisions you will make in life. You should only choose the O'Neal Law Firm if you want 1) Full compensation for your injury case 2) a lawyer you can talk to 3) a lawyer who has a reputation for winning 4) and you want to be treated with respect and dignity throughout the process. If you are in need of representation or counsel contact the O'Neal Law Firm today for a free, no obligation consultation. 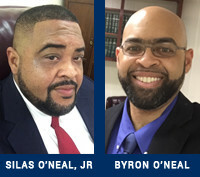 The O’Neal Law Firm serves clients throughout Louisiana, including Rapides Parish, Alexandria, Pineville, Baton Rouge, New Orleans, Shreveport, and Monroe.